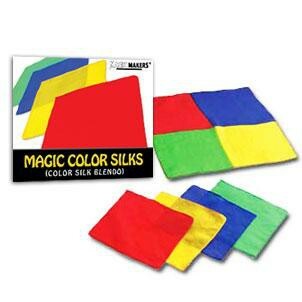 A red, yellow, blue, & green silk are placed into the magician’s fist. The fist is opened showing the silks have transformed into a large silk with all 4 color silks blended together! Thumbtip included so you have everything you need! Illustrated step by step directions! Blended silk is 7.5 x 7.5 inches and the individual colors are 4 x 4 inches.